While action cameras like the GoPro are more popular than ever, none of them address the particular challenges divers experience. Factors like pressure, temperature, and quality require equipment that balance toughness with quality. The ideal diving camera is versatile, durable, easy-to-use, and able to generate high-quality stills and video. The Octospot does all of this and more. The cylindrical device is made of anodized aluminum and polycarbonate for a sturdy design that doesn’t require an external casing like other action cameras. This allows divers to get to a max depth of 656 feet without any adverse effect on the product. While they dive, the Octospot constantly monitors depth, temperature, and pressure data, displaying it all on the device’s 0.5″ OLED display for quick reference or overlaying that information later over the 12 MP stills and 4K-caliber video divers can review and easily share using the Octospot iOS/Android app. The high-quality lens packed into the Octospot is made even better with the device’s pressure controlled auto white balance (clearing up the muddy greens of deeper depths) and electronic image stabilization (eliminating a recording’s shakiness). Combine that with its single button operation (clicking it once snaps a photo, while holding it records a video), 2+ hour battery, 64GB of expandable storage, and a wide variety of mounts for a first or third person views, and the Octospot gives divers all the versatility they’re looking for in a compact package. $399 gets those interested an Octospot, a mask mount, and a universal mount for other accessories by January 2017. The product’s Kickstarter is aiming for $80,000 by August 4th, 2016. The Octospot camera is extremely versatile, sporting just the right number of bells and whistles to boast an array of useful features while still retaining a small form factor. 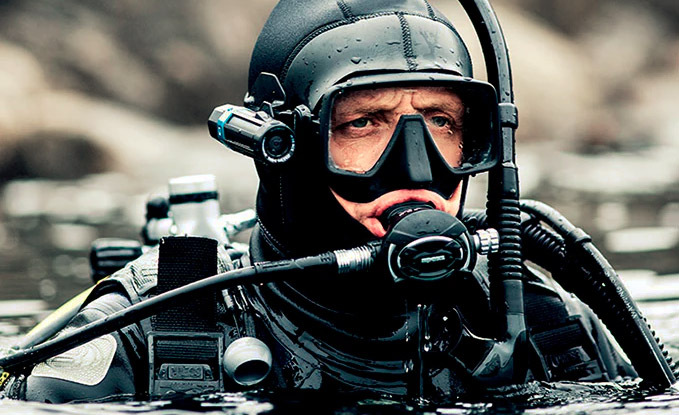 Its design runs contrary to products like the Video Diving System that don’t really do anything to make the process of recording underwater any easier. The Scubus S, on the other hand, makes an attempt to improve underwater recording, going as far as including acoustically traveling group chat functionality. What it doesn’t include is the high-quality video and the flexibility of different mounts, something that makes the Octospot a superior choice at the end of the day.